Based on an unbelievable against-all-odds survival story and the subsequent tell-all book titled A Captain’s Duty: Somali Pirates, Navy SEALs, And Dangerous Days At Sea, Captain Phillips marks the return of acclaimed British director Paul Greengrass. Working from a skilfully crafted screenplay and propelled by an incredibly devoted performance from Tom Hanks, Captain Phillips is a tightly wound thriller that’s every bit as tense and riveting as it is unsettling and deeply moving. After bidding a fond farewell to his beloved wife (Catherine Keener), Richard Phillips (Hanks) makes the trip to Oman to captain a routine transport vessel to Kenya. As the ship passes through the hazardous Somali waters, however, Phillips finds his vessel hijacked by pirates, led by intrepid leader Mute (Barkhad Abd). In an attempt to save his crew, Phillips risks his own life, only to be taken hostage by the pirates aboard a lifeboat, bringing about a cat-and-mouse chase between the US Navy and Phillips’ captors. 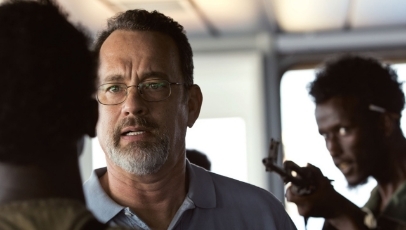 There’s absolutely no denying the fact that Captain Phillips is a distressing piece of cinema. Yet that sense of fear and uncertainty is needed to convey such an unthinkable, yet astonishingly true story – and its captured extraordinarily by Greengrass. The realism that is infused into the film through his directorial flourishes – from the great use of shaky cam to the lack of digital wizardry (the film was shot on a real cargo ship as it was still in use) – ensures more or less every second of the 134 minute run time is tightly drawn. The film hits a couple of snags in the second half as more time than necessary is spent in the cramped confinements of the lifeboat, and Henry Jackman’s score is often a little too exhaustive. But those issues are never serious enough to harm the film as a whole, and screenwriter Billy Ray is always quick to get things back on track, whether it be through big-scale dramatics, or more low-key apprehensions. And it’s a credit to him and Greengrass that both Phillips’ and the pirates’ wildly different viewpoints and worlds are fleshed out equally, usually in quick succession. Captain Phillips is a real rollercoaster of a thriller, as the narrative ebbs and bows in time to the real world horrors that are captured with such raw intensity, power and veracity by cinematographer Barry Ackroyd. Hanks delivers a phenomenal performance as Phillips, while Abd, who was plucked from normality, makes for a convincingly terrifying foe. As the film reaches a powerful and climactic end point, the audience will likely be left in a trembling state of shock. And that is more than enough to certify Captain Phillips as a prized thriller. Good review. As a thriller, the movie was really working is magic. However, once those final minutes showed up and Tom Hanks let loose, it becomes something so much more. Thank you so much for your kind words and for checking out my review. I completely agree with you, it really does become something else in those final fifteen minutes or so. Good review, and definitely a solid film. Tom Hanks was great, and I loved the way the film was captured. Though I did personally feel I woulda liked to have spent a little more time with Hanks and the pirates rather than jumping away to the military and whatnot, but that’s just my take at least. Excellent review! I’m definitely checking it out. I’ve seen snippets here and there about this film but, paid little attention. It’s great to hear an honest review that’s not from the studio. I’m definitely checking this movie out!